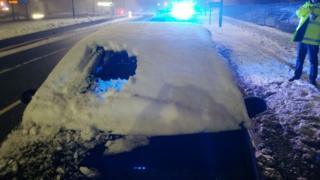 A driver who only cleared a small gap in their snow-covered windscreen before setting off has been reported for careless driving, police say. Essex Police officers stopped the driver in Harlow just before midnight, Insp Matt Allsop said in a tweet. Parts of Essex saw up to 10cm (4in) of snow on Sunday, leading to road closures and travel problems across the county. On Monday, more than 50 Essex schools were closed due to the weather.